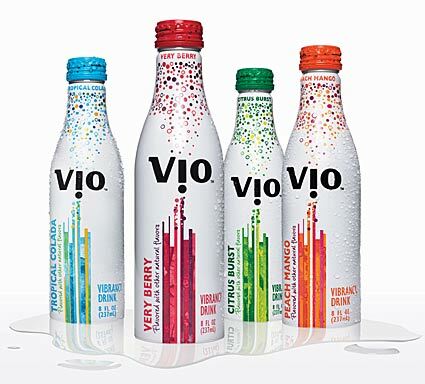 The soft-drink maker is currently test marketing a sweetened fizzy milk beverage called Vio. Made with sparkling water, a hint of skim milk and cane sugar, the 8-ounce beverages come in four fruit flavors: Citrus Burst, Peach Mango, Very Berry and Tropical Colada. Fizzy milk drinks may be new to the States, but Coke has sold a similar product, Qoo, in Japan since the late 1990s. In New York, the drinks are selling for $2.49. Questo articolo è stato pubblicato in DRINKS, FOOD AND GASTRONOMY, FOOD DESIGN da EBV . Aggiungi il permalink ai segnalibri.